This is part of a series I'm doing on improving my cardmaking through studying other designer's cards. If you're unfamiliar with it, you can read more about it here. I'm back today with another card inspired by the talented Yana Smakula. I wanted to make a card that used some of the lessons I learned in my first post in this series. In that post, I talked about how Yana stamped the images in her card perfectly and then added details between the images that added richness. The card that I made, inspired by hers, had more space between the images and didn't seem as exciting to me. So for this lesson, I wanted to see if I could improve my stamp placement and fill in some of the spaces between the images. Is that a stunner, or what? Yana created a white border on a one layer card with no masking, so that none of the images were cut off. 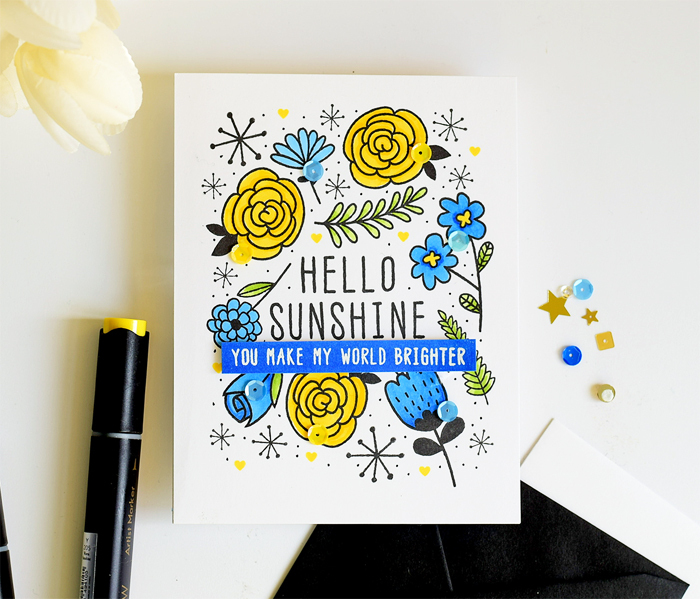 And, here's a beautiful card Yana made a couple of years ago using Altenew's Hello Sunshine set. Once again, Yana perfectly placed the images in both cards. Both cards have clever details that add a lot of interest. In the first card, the white border with no masking is beautiful. If I didn't see her make it on a video, I wouldn't have believed it! In the second card, Yana added a gray shadow around the images, drew white dots inside some images, and popped up the sentiment. She also made a wreath out of a non wreath set. That's hard to pull off well. All those things make her card special. Both cards are bright and colorful. Who wouldn't want to take these out of the mail box? They are "simple" cards that aren't simple at all. Placement of the images is really important. It's hard to make a card with a white border without masking. If I had to do it over again, I wouldn't use that large blue flower in the lower right. And, the next time I try this design, I'll place paper around the border so I have a guide. And there will be a next time. The Hello Sunshine set doesn't have any tiny elements, so I found a small heart from another set and used a fine black marker to make the dots. I think it added a lot. Yana colored white cardstock with a Copic marker to make matching paper for a strip sentiment in this card, so I copied that technique here. It's a surprising break from white on black cardstock and I like how it turned out. 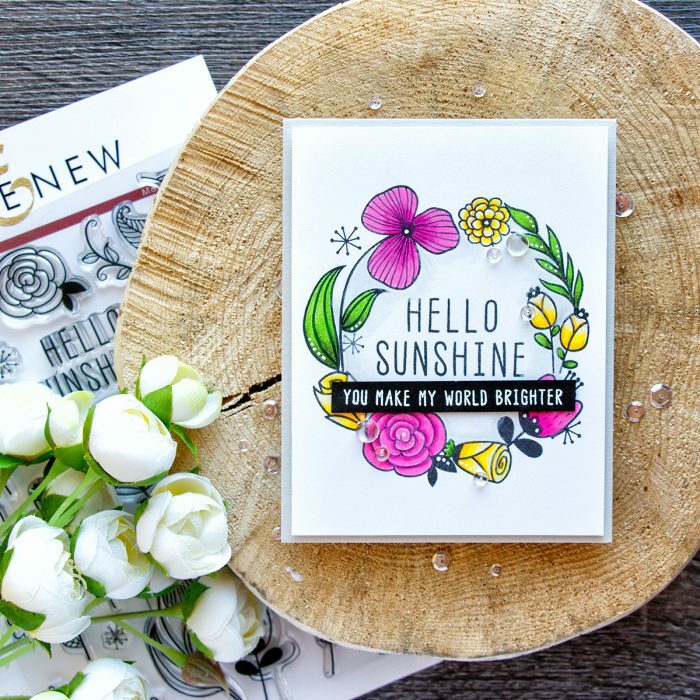 Altenew Hello Sunshine stamp set; Altenew Buttercream, Warm Sunshine, Ocean Waves and Dusk alcohol markers; Wow Bright White Superfine Embossing Powder; Hero Arts Intense Black ink; Micron black pen; Neenah Solar White cardstock; foam tape; sequins. I cannot remember where I found that heart, but those tiny elements come in handy. MOOD WHEN DONE: I love the card I made and I don't think or say that often. It's not perfect, but I'm aiming for better, not perfect. Thank you for reading along and commenting. I'll be back next week with more Learning Through Inspiration. Very well done! I love Yana's cards. Placement of images is always a challenge for me. Thank you for posting. Looking forward to the next time. Take good care. Fantastic card! I love this series, I think my comment on the first post got lost. Your process is fascinating, and I love your designs, as always. Great inspiration! So happy for you. love the blue and yellow colors you used, Joan - delightful card - i think doing backgrounds with stamps is really difficult and you did a great job - you should love this card! Beautiful card Joan! I love the bright colors you chose. I’m really enjoying this series too. Card design can be difficult and you are breaking it down for us. Thank you! Joan, this series is FABULOUS! Yana is amazing, and so are you. There's rarely anything simple about simple cards. You nailed this one! Very well done, Joan. I love your card. Thanks for this series of helpfulness. Awesome "learning" cards! They turned out fabulous! Dang you did good Joan! Perfect colours and placement and the filled in bits....score for the win!!! Adoring this learning so much (and having a why didn't I think of that moment) ... can't wait to see what you learn next. Your card is lovely! 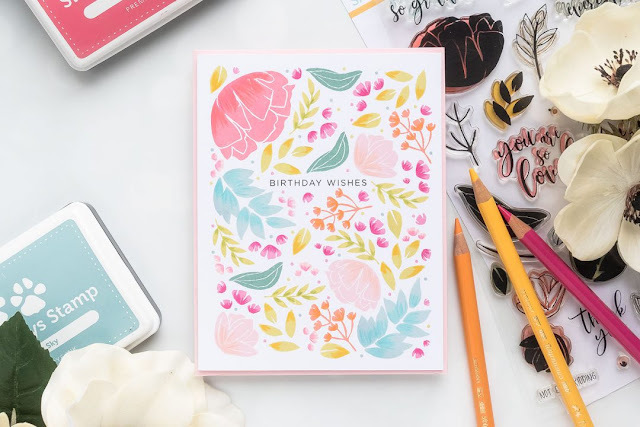 I am really enjoying and learning from your analysis of Yana's designs and the way you are applying it to your cardmaking. Again I'm reading and scrolling back, studying your study very closely. Yana is a good one to emulate, that's for sure! I like how you combined elements of both her cards into yours. The bright colors and cheerful stamps are beautiful. I'm curious as to where you started -- inside out or outside in? I think the weight of the blue flower in the lower right is good, but maybe you're concerned about the stem being outside the perimeter just a tiny bit? You're very exacting! I like the perfectly matched color of the sentiment panel. Shame on me for so rarely embossing. Very interesting, Joan. I'm looking forward to more! Me thinks you live in my brain! Yana was also the one who inspired/taught me to random stamp. I LOVE doing it. And I loved the top card when I first saw it, and was then flabbergasted when I watched the video cuz I hadn't even realized exactly what she had done to make it jaw dropping. I've not tried the "border without masking" technique. Yet. Another great card. Yana is really good at using small stamps to create card backgrounds. I love your card and I agree the little yellow hearts and black fine dots add a lot of interest to the design. I love the blue-yellow color scheme, and I think your border looks great. TFS.